The dialer and the phonebook share a single app although there are two shortcuts, bringing you straight to the tab you need. The app has been updated with the new flat looks, but everything else is the same. The app uses a tabbed interface - recent with dialer on the first and the contact list on the second. Contact info is displayed as a list of all available details. Custom ringtones can be selected for each contact and duplicate contacts can easily be merged into a single entry. Xiaomi Mi 4i supports voice call recording and it can do it automatically on each call if you like. You can also assign an answer gesture, pre-define quick responses upon reject, there is even support for internet calling. Unfortunately, the Xiaomi Mi 4i scored a Below Average mark on our loudspeaker loudness tests, meaning you may miss some calls and notifications if you don't keep a close eye on it. The loudspeaker sound quality seems rather poor too. The Gmail app is pre-installed, but you can opt for Inbox, if you prefer, from the Play Store. The generic Mail app is capable of handling all kind of mail accounts, including Gmail, and it can handle multiple Exchange, POP or IMAP inboxes. You have access to the messages in the original folders that are created online, side by side with the standard local ones such as inbox, drafts and sent items. MIUI offers Google keyboard by default - it has always been pleasure to use and is one of the most preferred Android keyboards out there. 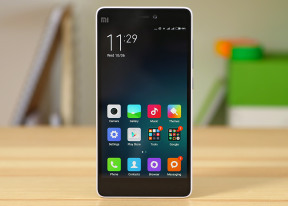 On the Mi 4i screen the keys are comfortably large in both portrait and landscape mode. There is support for gesture typing, handwriting and voice input. Themes are available, too.